The official biography of an NHL legend - Available now! By the time he retired, Brad Park had surpassed the great Bobby Orr in career assists by a defenseman. Inducted into the Hockey Hall of Fame the first year he was eligible, and later named one of the Top 100 NHL players of all time by The Hockey News, Park will forever be remembered as one of the greatest men ever to take the ice. 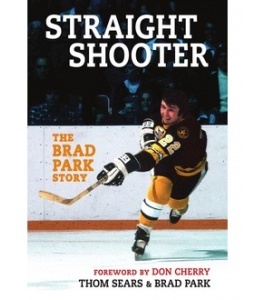 The first and only authorized biography of Park's life and career, Straight Shooter: The Brad Park Story , delves deeper into his legendary success than any book has before, bringing together exclusive, candid insights from Park himself, as well as interviews with dozens of players, family members, and key figures from the hockey world. Covering Park's early years growing up in Toronto, to his first exposure to the NHL with the New York Rangers and his stellar performance with the Boston Bruins, through the twilight of his career and retirement, the book examines every aspect of his remarkable life in unprecedented detail. Giving hockey fans a full, frank look at the career of an NHL legend—including the challenges Park faced in his personal life, including caring for his physically handicapped son—Straight Shooter is a fascinating look at one of the game's true greats.